With the current election cycle that is going on it seems as if the country is even more divided than it ever has been before. While the arguing between parties gets more intense, it would be hard to believe that the disagreements would ever get to be so intense that it would lead to a second Civil War. Warlords of Appalachia #1 does not look at what caused or what happened during the second Civil War, but instead focuses on the country as it comes together, while the citizens of Kentucky refuse to rejoin. 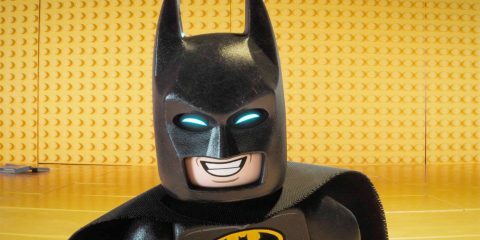 We are given a quick rundown of what may have caused the initial fracture in the country, by what seems to be a typical talk radio show host. Of course as a talkradio host, trolling for more listeners the version of his story is filled with obvious bias while also pointing out the flaws of those who oppose his ideas. The end of the book reveals an interesting fact about the radio hosts that once revealed makes many of his comments much more interesting. The book follows the life of Kade Mercer, who is just trying to live his life while protecting his family deep in the woods of Kentucky. Of course, without a run in with the occupying troops then it would make for a pretty boring and short comic book series. As Kade continues to try to avoid too much trouble with the troops, an uprising in town brings the conflict between Kade and the troops to a head, and forces the government to prepare reinforcements. 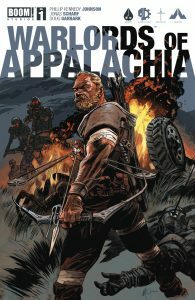 Warlords of Appalachia #1 does an excellent job of setting up the beginnings of this series without overwhelming the readers. We know that there are at least three different groups that are all angling to control all of part of Kentucky. You have Kade Mercer who while a seemingly a simple family man and mechanic, there are enough hints that it is obvious there is more to tell about his story. In addition, you have the “Blueboys” who are people living in the woods of Kentucky and have been affected by a drug called sweetrock. We do not see much of the group in this first issue other than to know that people, including Mercer seem to be scared of them and that Mercers son seems to be effected by the same drugs. It will be interesting to see where they go next with these characters and what there story is. Finally you have the military troops that are in the area, and while it would have been easy for Johnson to just make them nameless faceless troops that reign down on the citizens, instead we are treated to some of them having obvious complicated back stories that will be explored somewhere later in the series. Warlords of Appalachia #1 is the next in a long line of comics lately that have some type of dystopian society, but for what ever reason this one feels different to me. The are allot of moving parts in going on here and while there is some science and mysticism to the story it is one that is mainly based in the real world. Is the United States going to fracture and go into a Civil War tomorrow? No, but the elements that are discussed in Warlords of Appalachia are ones that exist today within the United States. Scharfs art is another thing that is based in reality with the use of main earth tones throughout as the characters moves through the hills of Kentucky. The use of shadows and lines adds to the age and stress that the characters would have lived through in a time like this. When violence does happen the wounds and blood are also kept at a more realistic level then other comics. I think that if done right the series has a ton on potential. Quite a few elements were touched on in this first issue so there will be plenty to work with moving forward. My concern is if they introduced and moved forward to fast in this first issue. To go from being a quiet mechanic, to getting ready to fight the military is a big jump to make. I wonder if some more lead up to that would have helped the reader understand the deeper conflicts between these groups. The second issue could go a long way in telling the reader where we are going next, while unpacking some of the mysteries that were touched on in Warlords of Appalachia #1.